You can manage the protection of specific posts, pages, categories, comments from the “Manage Content Protection” menu of the eMember plugin. 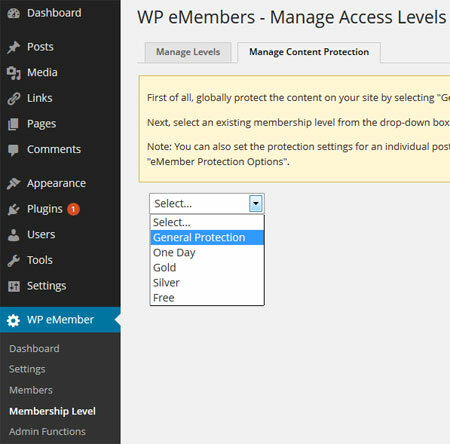 You can also set protection of a post or page while editing it in the WordPress editor. You perform the following operations in the “Manage Content Protection” menu to protect content in eMember. Lock-down the content you want to protect via General Protection. Select the items you want protected while you have “General Protection” selected from the dropdown menu. Then select a membership level from the dropdown menu and select items you want accessible to that membership level. Do this step for all the membership levels. First you need to protect the content by selecting “General Protection” from the drop down menu and checking the checkboxes next to the posts, pages, categories,comments that you want to protect (don’t forget to hit the ‘Set Protection’ button). Now that you have all the important content locked down, you can start to selectively give access to it according to the membership levels. Select a membership level from the drop down menu and check the checkboxes next to the posts, pages, categories, comments that you want the members of this membership level to be able to view (Don’t forget to hit the Grant Access button). To protect content for a specific membership level simply select the membership level from the drop down menu and check the checkbox next to the individual posts, pages, categories that you want to give acess to. The easiest way to manage content protection is through the protection of “Categories”. It allows you to give access to all the posts or pages under a certain category without having to individually select each post or page. So for example, you can create a category called “Basic” and put all the posts and pages under this category that you want to give access to for the “Basic” Membership level. How do I keep show different navigation menus based on whether someone is logged in or not? If any possibility with this plugin to give a user level access in post or page specific content ?? Hi Carol, I believe the following forum post should answer your questions about the “More Tag” protection. If I am using the more tags do they work on posts and pages? if I use the more tags what should I be setting in the pages/posts protection pages (I currently have protection set for the specific members pages and access to all posts allowed by anyone but want to change this so that access to everything is either completely locked to non members or I can show posts but as a teaser and use teh more tag which will then tell people they have to be a member to read the rest. If you are using a subscription payment button created with eStore then simply check the “No Expiry” checkbox and everything will be taken care of. The fixed lenght option (e.g. 6 months) comes in handy when selling a one off membership via a “Buy Now” button. OK – didn’t see this one answered anywhere. I have both eMembers and eStore installed. On the eMembers Membership Levels setup – it asks for Subscription Duration (on eStore I have it set up for a monthly recurring subscription). Do I set the eMembers duration for No Expiry or 1 Month? I want it to recur every month with automated billing and not expiration as long as they are paying. Great plugins and great work – thank you! Sorry, I’m not crazy I promise, lol! I got it to work. Thanks! Okay, ignore the last part of my question, it now says expired. But I can still get to pages that should be for members only. Also, I have all pages, posts, comments, and categories should be open to everyone with a free 1-day, paid 1-month paid 6-month and paid 1-year subscriptions. I have another question…do I need to do anything specific to make sure that the members can no longer access content after their membership is over. For example, I offer a one day free pass, and when I signed myself up for it, I still have access even though the 1-day pas should be expired. Also, it states (when I log in) that my free trial is still active and it should not be active any longer. Not sure what I’m doing wrong. According to the following table you should give access to Cat A and B for level 2? Can you please double check that you have given access to Cat A and Cat B for level 2? I only grant access to Cat B but It is denied ? So Level 2 is Acting like Level 1. Once you find it replace it with what you want. You cannot add a WordPress Page to a category (WordPress do not allow this). So you will have to selectively protect the pages from the “Pages” section of the content protection. Thanks again, have added categories now under the posts section so they are showing up. However, I still can’t add a page to a category as you suggest in the article above. My research has shown me there is a firm line by WordPress developers that this shouldn’t be done, but for the purposes of my site using your plug in, it is an ideal solution. Do you know of any plugins or methods I can do this by that work with your plugin? I saw one from Yellow fin or someone, but it seems to have been recently removed. The only other way I can find is to recreate all my content as posts and categorise, then insert the posts into pages, but it’s a last result as it would require a lot of rework. Any suggestions or is this my only option? P.S. As requested, I have privately emailed you my URL, as my website is a bit of a mess at the moment so I don’t want to post the address publically. How many categories do you have in your WordPress? If you haven’t created categories in WordPress then eMember won’t show them. Please post a link to your site too so I can take a look at it. I downloaded your plugins for the ecommerce store and membership. They are fantastic! I have set everything up, but am having one problem. I have set up my categories, but I can’t figure out how to put all the pages I need into each category as you suggest above. When I click on manage content > categories, it just lists ‘uncategorised (0)’. Help please? Hi Steve, yours should work fine… I will contact you via email to see if we can organize site access to address this issue. eMember v.3.3, php5.2.10, this may be why I’m having trouble adding membership levels? btw, that php print registration form worked perfect, thanks! This has been seen on servers using a very old version of PHP. any idea of what the PHP version of your server is? Also, what version of eMember are you using? I’m just getting a red “Loading” no matter what content type. I am using Chrome browser and wp 2.8.6 if that helps. Thanks! Hi Val, Which means the member you are trying to log in as doesn’t have prevelidge to see “Gold” membership content. Verify that the “Membership Level” of this member is set to “Gold” by going to the “Manage Members” tab under the “Members” menu and clicking on the “Edit” link next to this member. To test membership settings on my site, I created a GOLD member and then went to my login page. I get this message though when I try to login : Sorry! You need to upgrade your account to view this content. I double checked the access of this level and I see no problem. Problem solved, my server wasn’t using PHP5, it is now and everything is fine! When I select a membership level in the ‘Manage Content Access’ page, it just says ‘Loading…’ and none of the pages appear in the table. I’m using WordPress 2.8.6, and everything else seems to be working. If you could let me know what might be going on that would be great! Hi Michael, First you need to protect the page. 1) Select “General Protection” and check the checkboxes next to the pages that you want to protect. 2) Hit the “Set Protection” button to protect these pages (this makes the pages not accessible). 3) Now select the membership level that you want to give access to this page to and grant access accordingly (I believe you have done this already). I defined three membership levels. But how do I protect a specific page in order to make only these three levels see the page block access to that page to any other (not logged in) users? I think I did what you mention above. I select a level and check the box next to a page (support in my case). I did the same for all my three levels (having access to the same page but for different amount of time). When I enter my site without beeing logged in I still can access the protected page. What am I missing?